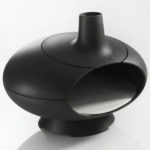 After a pizza oven which can sit on any heat-proof surface, looks great and does a top job? 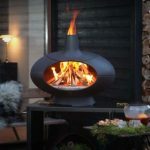 The award-winning Morsø Forno is made from stainless steel and has been designed to look like a traditional Italian outdoor oven, with an open fire feel. With a wide firebox which is situated low down, the perfect temperature is radiated throughout the oven to get the best possible result each and every time. 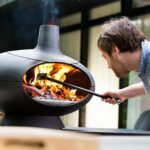 There is plenty of room for firewood, no matter how many pizzas you are looking to prepare. And not only that, but it can cook so much more than just pizzas. It is a full outdoor oven, so there is enough space for the preparation of stews, casseroles and bread. If you incorporate the Tuscan Grill, which can be bought as an extra, you can go much further and prepare steaks, fish, vegetables and other similar food, with defined grilling lines. At 70cm tall and 60cm wide, it won’t take up much space wherever you put it. The good thing about it being table-top is that it can be moved around to wherever is best. This also makes it transportable so that you can take it on day trips and your next staycation without any trouble. All it requires to get going is wood, and the perfect temperature is reached in minutes. There are plenty of extras available to buy, such as covers, gloves, ash scrapers and even a dedicated table base. Perfect for those serious, authentic pizza lovers out there.